Hello everyone. How's your Friday so far? Mine was a bit productive because I was able topschedule the reviews that I will be doing for my blog. For me, it is fulfillingaccomplishing something you really love doing. So be ready for more reviews,first impressions on some products, FOTDs and NOTDs. Also, please don’t forgetthat I am currently doing collaboration with my 2 fellow bloggers. Read here for more information. Are you the type who has barely noticeable eyelashes like me? Seriously, myboyfriend’s eyelashes are longer and fuller than mine. I will be doing a series of product reviews which will be focusing on lash products. I will be showing you how I make my short and very thin lashes look longer and a bit thicker.Let me start off with my current eyelash curler. It is the Touch Beauty Heated Eyelash Curler. - It really does it's job. See my noticeable lashes now? - It's lightweight and handy so I can bring this whenever we travel. - Curls quickly after the product has warmed up. - Although it's heated, it did not hurt my eyes or did cause any uneasy feeling. - It looks cheap and I think it won't last that long. I've had this for 2 months, I think, and so far it's still doing it's job but the pink rubber pad is starting to be detached. Whenever that happens, I just push it back in place. - It's high maintenance since it uses a lot of battery energy. I think the batteries were able to last up to 10 usage. Rechargable batteries are highly recommended. - You need to let the product warm up for at least 2 minutes before using it. I guess that explains the previous con. I like the product because it really curled my lashes BUT I don't love it for the fact that it could break anytime. I have yet to compare this with a normal eyelash curler. Maybe. But I am planning on getting the one from Ardell. It is more pricey but it looks more durable as well. Disclaimer: Item bought by my own money. I was not influenced to make this review. Reviews are of my honest opinion. So far naman intact pa ang eyes ko. Hehe. Pero you're right about burning my eyes if the heat accidentally goes up. Who knows diba if magmalfunction? I guess you can try muna without turning it on. See first if di maiipit yung balat or mabubunot yung hairs. Then pag ok sya, try mo muna pag di pa sobrang init. Safety first pa rin kasi eyes yan. 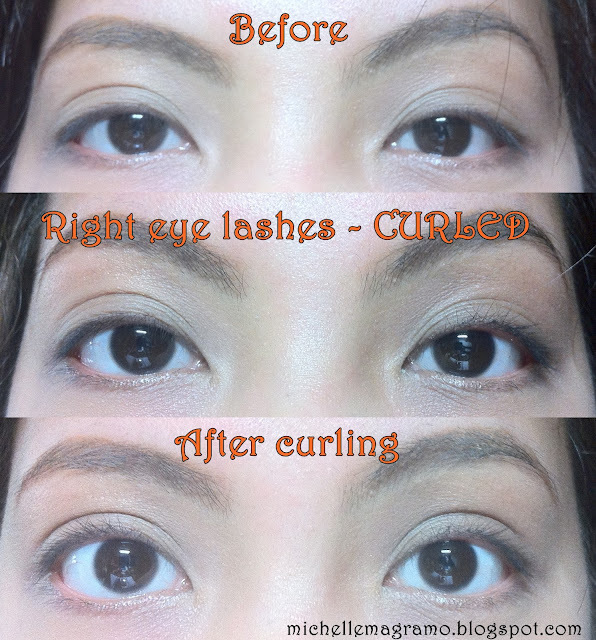 Warm na kasi sya sa eyes kahit di sobrang short yung lashes. Tolerable pa. I am just not sure if pag super short na. Yes. I will do a comparison between this and the one from ELF. You're welcome Iya. You use it parang normal eyelash curler lang except na eto heated. Hi! i have one too, somene gave it to me as a gift but never used it since im afraid i might burn my eyes. Do you recommend using it if i have short lashes? Also want to ask like nicole if this is better than the regilar curler. Thanks! I haven't used normal eyelash for quite some time now e. I have the one from ELF. Can you wait for my review on that? I will also do a comparison.